Steven Pinker, whom we last saw here making a hash of the mind-body "problem" and earlier denying the existence of human dignity, is a Public Intellectual. Now, someone who intellectualizes in public may have other bad habits, and here we find him setting eyes rolling among both statisticians and historians with a book entitled The Better Angels of Our Nature. Dr. Pinker sometimes presents as a scientist, but on closer examination, we find he is only a psychologist. (Yes, yes, I know; but for me the touchstone is physics.) It is unclear what aspects of training in the psyche provides expertise in historical analysis or even in statistics. Psych majors often take Stats-for-psych-majors, but this ought not be confused with the true quill. 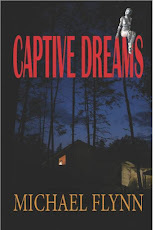 Certainly, any author who gets his name in larger type than the title of the book is an Important Author. But perhaps this is no more than a distinguished expert in one field trying to import that distinction to an alien field, with indifferent results. Note that eight of the nine involve people riding horses. Surely equestrianism is a major source of bad behavior. It's all that horsing around. However, the first thing Ye Olde Statistician notices is that these are not all the same kind of thing. There is a problem of operational definition here. Why are "the Mongol conquests" all lumped together when the wars of German imperialism (Dano-Prussian, Austro-Prussian, Franco-Prussian, and World Wars I and II) are counted separately? Does "the annihilation of the American Indians" include the massacre of Ft. Sims or the attack on Jamestown? Some of the nine are sharp, somewhat well-defined conflicts; others are long, drawn out processes over many decades or even centuries. Why not count the "wars of nationalism" as one long, drawn out conflict along the lines of the slave trade? Why not include the deaths from poison gas, machine guns, nuclear weapons and such as being due to "the science trade"? One (#7) is arguably due less to man's violence than to disease. But then so were most deaths in most past conflicts. But then is the Spanish Flu included with World War I? Most Amerinds died of disease; and given the circumstances, would have died had the Europeans come with rainbows and fluffy bunnies rather than swords and muskets. The Black Death took about a third of Europe (according to some estimates) but its spread was facilitated by the Mongol conquests. Was the plague accounted to the Mongols or not? These are non-trivial questions in statistics. The first problem is always that of operational definition of the unit of study. The second is... where the heck did he get the death toll numbers? There is a weird tendency on the part of moderns to suppose that numbers tolerably well-known in the Late Modern Age were just as well known in earlier ages and other milieus. Therefore, wild guesses are given the same credence as actual counts and measures. TOF has seen estimates of the Amerind population of the US and Canada ca. AD 1500 anywhere from one million to forty million. So how big was #7? Pinker uses a table of historical death tolls, which according to Humphrey Clarke at Quodlibeta "appear to have been lifted from a site called ‘Necrometrics’ authored by Matthew White." 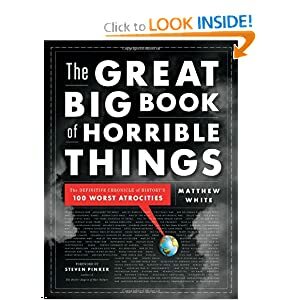 In fact, Pinker cites Matthew White's Great Big Book of Horrible Things (Norton, 2011), as if it were actual historical research. White is a librarian with "a few years of college" who seems to make a hobby of amateur history, including some whimsical "surreal histories." From an SFnal/AH pov, his site is rather engaging, even when he succumbs to Standard Issue assumptions. So how does Pinker know how many people died in the great An Lushan Revolt? He obtains the figure from White's little big book. How a librarian with no training in history becomes a reliable source for medieval Chinese history is a mystery. The figure is obtained by comparing the Chinese census of AD 753 (52,880,488) to the census of AD 764 (16,900,000). Holy moley! Where'd 36,000,000 Chinese go? They must be casualties of the revolt. After the An Lushan rebellion, the Tang court lost the ability to enroll, enumerate, and impose taxes directly upon the majority of China’s peasant households. This development is dramatically illustrated by the decline of the registered population from approximately nine million households in 755 to less than two million in 760. IOW, the enormous decline in population was due to the disruption of the imperial administration, the rise of regional warlords, and the bureaucratic inability to count them rather than to death in the revolt. Oh, well. An ancestor of my wife appeared in the 1850 US census and the 1870, but not in the 1860. Would anyone assume that he had died in the Civil War and been resurrected? Or simply that a family traveling in a covered wagon across the Midwest might plausibly be missed? This is sometimes legitimate. If a triangular plot of land is surveyed and the interior angles do not sum to 180º it is perfectly okay to adjust the measured values. There are at least two different ways to do this, and the choice should be justified. So what did Pinker do with the raw swags he used for "data"? In order to obtain his ranking, Pinker norms the supposed death tolls of these events to the world population at the time, as if dividing one swag by another swag would yield a useful ratio. However, let's consider that definition. There are two relevant problems. We Are the World. What relevance has the world population to measuring the magnitude of violent events? When the allied Kickapoo, Ojibwa, Ottawa, Potawatomi, and Sac and Fox tribes massacred the Illinois ca. 1769, should the death toll have been divided by the total population of the world? China, India, and Europe were well beyond the reach of Kickapoo arrows and were not at risk. Perhaps the relevant divisor should have been the targeted Illinois population? Or if the Illinois fought back, perhaps also the population of the Kickapoo army? Similarly, the vast majority of the world was never in harm's way of An Lushan's armies. Why should the "fall of Rome" be scored based on how many people were minding their own business in India and China? When the Germans systematically rounded up and massacred Jews, was the relevant denominator the world's population, Europe's population, or the Jewish population? 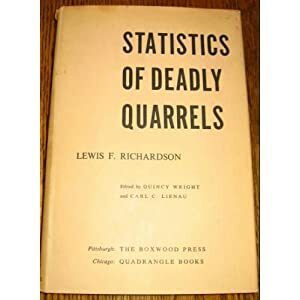 For a consideration of how this might be better done, consider Lewis Fry Richardson's "The Statistics of Deadly Quarrels," which looks at violent acts ranging from individual murders to wars. Richardson applied the methods he had developed for weather systems to the question of violence, using statistical analysis, goodness of fit, and systems of differential equations. Two excerpts appear in Newman's The World of Mathematics: "Mathematics of War and Foreign Politics" and "Statistics of Deadly Quarrels"
For example, Richardson divided both the Great War and the Napoleonic Wars into individual conflicts: The Western Front, the German-Russian Front, the Italian Austrian Front, and so on. This is the opposite of Pinker's Lumping strategy. 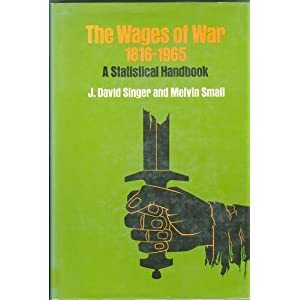 Another example is Singer and Small's work, The Wages of War, 1816-1965: A Statistical Handbook. Both Richardson and Singer/Small confined themselves to a range of times for which fairly reliable data could be garnered, contrary again to Pinker's strategy of swag data. Quantity or Quality? The second relevance question related to the metric is this. If the Germans has decided to eliminate Frisians instead of Jews, would that have meant they were less violent? If Hatfield undertakes to kill McCoys, does it matter how many McCoys there are, or how many he can get in his sights -- or only that Hatfield thinks nothing of killing them? IOW, what has the magnitude of success got to do with whether people have become more or less violent? For further discussions of Pinker historiography, see Humphrey Clarke's comments on the Albigensian Crusade, Medieval Murder Rates, the Mongols, and generically Christian violence, which seems to be Pinker's actual interest. His thesis does reinforce some folks in their prior beliefs, and so is praised in those quarters. World War I, as I recall, was a war fought mostly by Christians against Christians. That "as I recall" bit is pretty cute, and he seems to have written it as if it were meant seriously. But if that is his criterion then gandersauce requires us to count all the black men who were lynched by Democrats in the 1910s-1940s. World War I was also fought mostly by modern scientific Europeans against modern scientific Europeans. So what? It remains to be shown that Imperial Germany, Austro-Hungary, France, England, et al. went to war because they were Christian or modern scientific Europeans, or that mobs of Democrats lynched black men because the lynch mob were Democrats. Pinker seems impressed with what people call themselves or he would not have made that fatuous remark about WW1. North Korea calls itself a democratic republic, but need we take the claim seriously? If the Europeans of 1914 were Christians, they were simply members of the State Established Churches. Worship of the Nation had by then long submerged worship of God. War posters like the one on the left cited the State or the Folk, but not the Church. Or as our old buddy Tommy Aquinas put it, there is a difference between a human act and the act of a human. The former is what a man does because he is a human; the latter is merely something that he does. In the same way, a scientist (e.g., Fritz Haber) might devise a new means of mass murder (poison gas) for the Great War; but does he do it because he is a scientist or because he is a patriotic German? I don't mean his technical skills, but his motives. Even when there seems to be a "because-ness," closer inspection reveals greater complexity. Sure, there was a time when you could gin up a crowd to lynch someone because he was a dirty stinking Calvinist and this here is Lutheran land. But there are times and places when you could do the same thing using race or ethnicity or even economic commitments. If human beings are prone to violence, then it may not matter much what is used to incite them. Thus when we examine the Huguenot wars in France, what we discover is that three Great Houses were fighting for control of the French throne, and they swung back and forth between Calvinism and Catholicism as the needs of state dictated. "Paris is worth a Mass," Hank Bourbon famously declared as he shed his Calvinism for convenience. A more accurate title would be the War of the French Succession. Even the Thirty Years War is iffy. The German princes did not declare themselves independent of the Empire because they had become Protestant; they became Protestant because they wanted to declare their independence of the Empire. And can a war in which the Pope and the French crown supported the "Protestant" side really be called a religious war? It was really a war between Bourbon and Hapsburg, with both Protestant and Catholic princes on both sides. Heresy was often a surrogate for political disloyalty, which is why heretics were more severely persecuted by the secular power. The church authorities were derided as "soft-hearted" (clericalem verens mollitiem) because they preferred persuasion. Take another look at Pinker's list of the top nine, above. Note that the top six are all pre-Christian and non-Christian events. And the last three date from after the subordination of the Church to the secular State; that is, after the Concordances, the English nationalization, and cuius regio, eius religio. Is the pertinent metric really the number of deaths, even the number of deaths per world population, or the number of deaths per the at-risk population? If the thesis is that people have gotten less violent in recent times, would not the proper metric be the percentage of people who initiate violent encounters? Pinker's metric is a measure of success. It says nothing about the tendencies of human beings in general. If two wrathful sociopaths refrain from fighting because they each fear death at the hand of the other, can we say that they are less violent? Or only that they have not yet seen an opportunity for violence without retribution? "achieved notoriety through his attempt to reinstate the idea that the human mind is fixed and limited. His bestseller The Blank Slate: The Modern Denial of Human Nature (2002), an assault on the idea that human behaviour is indefinitely malleable, was controversial for several reasons—not least for its attack on the belief that pre-agricultural cultures were inherently peaceable. The book provoked a storm of criticism from liberal humanists who sensed—rightly—that this emphasis on the constancy of human nature limited the scope of future human advance." Yet this new book asserts precisely that malleability! Heh. But we don't have to take Gray all that seriously, either. After all, he is simply being remorseless but from the same pov as Pinker. 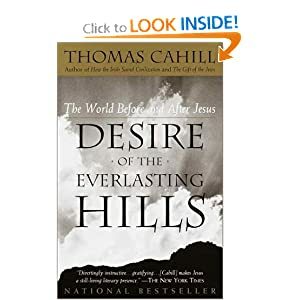 However, that being said, it is rather likely that violence has toned down since Cahill made the same point in his book The Desire of the Everlasting Hills. It's not the body count, so much as the insouciance with which we resort to violence. The degree of casual violence in the Classical world is almost unimaginable to us. We are far less casual about such matters now, and this is true despite sporadic outbreaks of mass State violence. Our technology allows States to kill more people in larger batches. But at one time the Men With Swords could and did kill with impunity. Pinker's anti-Christian animus does not let him entertain the possibility that it is the religion itself that has pacified the humanity. That includes Asian religions and Islam. Genocide was rare under Muslims and even the 20C genocidal attacks on non-Muslims e.g. Hindus of West Punjab were only possible under the influence of Western ideas (nationalism and progressivism) and not traditional Muslim attitudes. It occurs to me that none of this talk of atrocities takes into account the modern holocaust of abortion. What's the global death toll for that now? Pushing 1 billion? Right, right, abortion is a woman's right. But I guess if you start with the premise that the killing you do is OK and justified, while the killing that others do is not, it's easy to end up with the belief that you are more moral than the other. I'm sure the Medieval peasant would call us the monsters because we kill babies, while burning heretics at the stake is only natural. 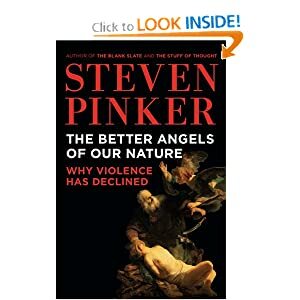 I am told that Pinker acknowledges abortion, but is ambiguous about it. He claims that before safe and legal abortions were available that the babies were simply killed after birth, by exposing them. And indeed, Tacitus complained that the Jews did not do this. However, it is hard to believe that they disposed of more than 20% of their offspring (45% in Russia) in this manner, or else where'd they get the men to man the phalanxes and legions? Mind you, the genocidal attempt against the Armenians occurred shortly before, rather than after, the Ottoman state's "traditional Muslim attitudes" were replaced by "nationalism and progressivism". I would be inclined to argue that there were no attempts at genocide before the 20th century. The word is widely abused (by Pinker, among others) to mean "killing a lot of people". It does not mean that. "Down through history, millions of people have died in conflicts over what a "Christian" really is, which is what so exercised Madison, and also what brought down a lot of Hitchens' wrath upon religion in general. History says that as soon as you start talking about "the only true message" in this regard, you guarantee that, eventually, people will get slaughtered in the town square." My reaction: Really? I'm no historian, but the little bit I do know seem to indicate that wars are depressingly common regardless of the belligerents' religious beliefs (or lack thereof). Certainly, if one includes every battle where different flavors of Christians were on opposite sides, then, yea, millions may have died in wars of christian sectarianism. However, if one uses the more serious and rational criteria of 'deaths in wars that would not have happened except for the religious difference between Christians - I'm not sure it adds up to 'millions'. Seriously, the French, English, various German states and other Europeans got into plenty of wars when they all allegedly believed the same things about church and God - do we really think that, whatever the causes of war were before Protestantism, that those causes ceased to cause and were replaced by denominational differences? Like the English and French, for example, ever needed a theological reason to want to kill each other? And does history show "that as soon as you start talking about "the only true message" in this regard, you guarantee that, eventually, people will get slaughtered in the town square." Lust, greed, bitterness, revenge, envy, pride, ambition - those things have lead to any amount of violence. In the same manner as with war, in order to attribute violence to christian sectarianism, wouldn't we need to look at violent acts that would not have happened except for such sectarianism? As a cause of violence, Christian sectarianism is generally not required nor sufficient. The burden should be on the one making the assertion that it is, in light of all the other causes that say that it is not. I think it was Chesterton who once said that if Christianity is to be condemned, let it be for the crimes that are peculiar to it and not for crimes that are the common lot of all mankind. The degree of casual violence in the Classical world is almost unimaginable to us. We are far less casual about such matters now, and this is true despite sporadic outbreaks of mass State violence. Our technology allows States to kill more people in larger batches. But at one time the Men With Swords could and did kill with impunity. What do you credit with the change? My own guess is that's a combination of the civilizing aspect of Christianity over time, combined with growing fear of retribution as a result of increasing technology with which to report, investigate, and punish violent crime - the same technology which enables previously unseen episodes of state-sponsored mass murder. I think you may be right, Deuce. Cahill made the same point in "The Desire of the Everlasting Hills." The Athenians exemplify the old order in their reply to the Melians when the latter asked them by what right they proposed to attack their small neutral polis: "The strong take what they can, and the weak suffer what they must." That's one reason I never felt too sorry that the Spartans kicked their butts in the end. A reminder to the strong, perhaps. IMHO, most men of that age would be regarded as sociopaths in our own. In Vol II of The History of Private Life, there are stories about the challenges faced by the Italian/Roman priests sent to Gaul in the 5th century and later. Among other things, the Franks, upon hearing that divorce was right out, thought nothing of simply killing undesired wives in favor of an upgrade. Revenge killings were the normal response to even the slightest slight, with a ritual mutilation and staking out at a crossroad of the still living victim. Interference with a revenge killing, such as by aiding a victim one might come across, put you in line for your own revenge killing. OTOH, murder could theoretically be paid off according to a schedule - so much paid to the pater for killing his slave, a little more for a courtier or daughter, and so on. BUT - touch his stuff - steal - and death is the only acceptable justice. The author describes the Franks as 'pre-logical' but sociopathic works as well. It strikes me that Pinker is right to measure the number of deaths vs the number of malicious intentions. Given all the times that a society or a person could have expressed violence, what were the number of times that they actually took advantage of the situation. I would call it the "where there's a will, there's a way" criteria. Also, I don't see much of a problem in presenting the ratio in terms of the total world population. If you are measuring a human trait in any given period, you're going to be interested in everybody alive at that time. Pinker is right to measure the number of deaths vs the number of malicious intentions. If you are measuring a human trait in any given period, you're going to be interested in everybody alive at that time. How does the number of people in China relate to how kindly the Kickapoos were when they wiped out the Illinois? If the Western Allies killed more Nazi soldiers in WW2 than vice versa, does that mean that Nazi nature had better angels? Without wanting to put an economic interpretation on the wars of religion, the underlying cause was undoubtedly the wealth of the monasteries. Henry 8 is our most common example [likely because we read English], but the same was true [especially true] in Germany, and then in Scandinavia, and to some extent in France. Without turning Marxist, I believe that greed is a fairly common cause of violence and of war. Possibly not to the soldiers, who rarely benefit; but clearly to those who are called "war" profiteers. Sorry, maybe I misunderstood. Wasn't Pinker measuring violence according to the number of violent deaths instead of the number of malicious intentions, etc.? I take your point that there are many different factors involved and that, even if the data was correct, Pinker would still be oversimplifying. I take it the first reference to "Singer" is a spoonerism. Mind you, one could have much fun with a composite character named "Professor Peeve Sinker" ("kill the unwanted babies, they'll be much happier that way") who (a) disbelieves in unverifiable, non-observable and therefore presumptively disproven concepts such as "morality" or "the soul", and (b) therefore advocates that all human decisions aim to maximise The Greatest Happiness Of The Largest Number. (Which can be observed and measured... er, orbiting around Pluto. I think).